Recently, some of our customers want to know more about the CWDM modules' applications. Here we share some of CWDM knowledge to you, hope these can be helpful for your business! 1. What is CWDM modules? With the CWDM optical transceiver, different wavelength can be transmitted by only one core. And it's receiver can receive signal from 1270nm-1610nm. 2. Where is the CWDM modules can be used? 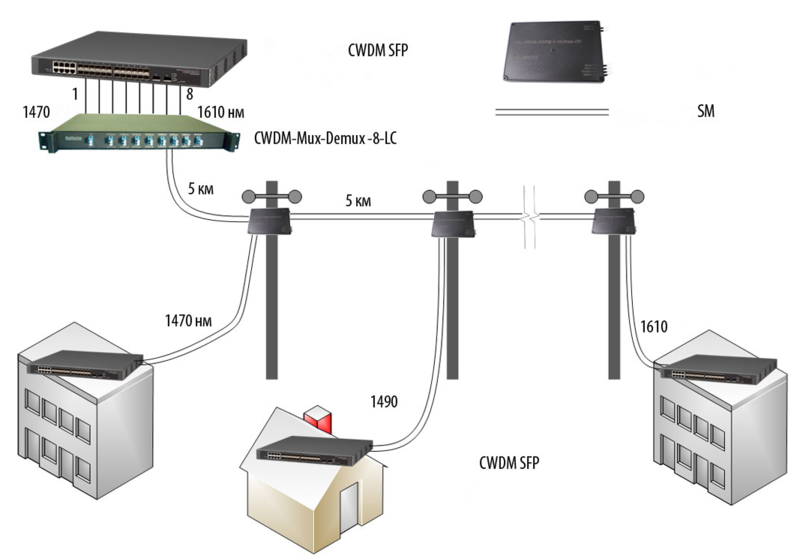 As the below picture, the CWDM modules can be used in kind of solutions. A: We often transmit and receive information with optical fibers. Because the optical fiber can help us sharing the information fastly, saving time and improving efficiency. On the other hand, it also needs to use lots of optical fibers, so in order to save optical fibers. We use MUX/DEMUX, it will help us concentrate the different wavelengths of information on one optical fiber. Then spread them to the different switch when they need to be used. 4.How many channels can be used in CWDM MUX/DEMUX? 5.How do they work together? The CWDM Modules were inserted into switches, and between the modules and MUX/DEMUX, they connect with patch cords. Because of the MUX/DEMUX, we can save lots of optical fibers. 6. What do you need in a normal solution? Base on different applications, the solutions are different. It involved the switch type, MUX/DEMUX channel number, etc. In a word, If you can tell us the project you are preparing(application), or where will the MUX/DEMUX(CWDM modules) be used, we can offer you the most suitable solution you need.